Mara Dyer wakes up after a coma unaware of what has happened. She's informed that in a freak accident that resulted in the deaths of her friends, she was the only one to survive. Her family decides to move to help her recover from the trauma. Instead, Mara begins to experience moments of hallucinations. It also doesn't help that she meets a boy who apparently knows her quite well. Mara must now determine if she really is losing her mind, or are all these delusions pointing her in the right direction. I actually picked this up because I've heard some pretty good reviews about it, care of the Book Tube community. Also because it's a psychological thriller, which I beg to differ a little but we'll get to that later. Right from the beginning, Hodkin has created a tone that will drive the entire novel. There's an underlying creepiness that basically stays at the back of your mind. I think what worked well was that I wasn't bombarded with constant "scary" scenes. Instead, there was a build up of suspense and lots and lots of questioning. I found myself experiencing Mara's emotions like I was right beside her. We were both confused and doubtful of her sanity. It felt so real. I think the visual descriptions were pretty gruesome. It wasn't something to make me violently sick but at the same I did feel a little uneasy. It's what made the novel feel different to the usual thrillers. Still, I wouldn't classify the Mara Dyer series as entirely psychological thriller. True it was scary and haunting, but the novel took a turn and it became a romance in the second half. I didn't mind though, because I grew to love her romantic counterpart - Noah. He was probably really stereotypical. The mysterious, rebellious boy with a beautiful smile and just enough arrogance that it becomes attractive. I still fell for him though. I know it sounds weird, I mean he isn't real. But that's how an author succeeds in writing a character. It's not like the romance in the novel deters from the central issue though, which was good. I wasn't going to keep reading if it was just the sappy stuff all the way through. It was still mostly about the inner conflict that Mara was experiencing. The Unbecoming of Mara Dyer definitely gave me a lot of shocking moments. It's quite possibly the one of the best novels I've read this year, having enough suspense and great plot development to keep me hooked for the entire time. The momentum rose and fell, keeping me on edge when needed. I read it in a day or so and couldn't believe how quickly I was drawn into it. Hodkin writes well, not above any other author, but certainly enough to catch my attention. Her plot is fast and intense, which I would like to thank her for. The ending finished on a massive plot twist and made me really want to go and buy the second book straight away. I mentally kicked myself as to why I didn't just purchase the entire series when I bought the first book. Still, now I have something to look forward to for next year. I definitely recommend this - an exceptional read. 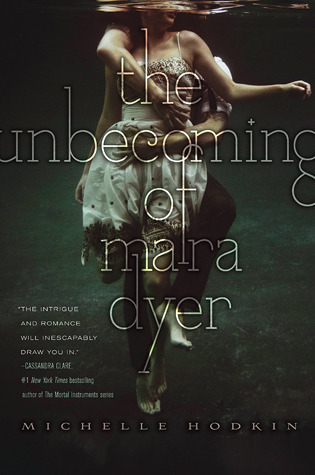 I really enjoyed 'The Unbecoming of Mara Dyer' and I really want to read the second book! Hoping to get it for Christmas, but if not I will buy it in January! Like you, I got drawn in very quickly and managed to finish the book a lot quicker than I imagined I would. For this reason I think when I manage to get a copy of 'The Evolution of Mara Dyer' I will reread 'The Unbecoming of Mara Dyer'. Exactly! I'm going to end up getting it in January but I really can't read. The ending has left me contemplating all sorts of things.